Helo. BLODYN yma, ond fe allwch chi fy ngalw i’n BLOD. Mae’n ddrwg gen i os cawsoch sioc - oeddech chi’n cofio fod VEG ar ei gwyliau? Mae’n anrhydedd fawr i mi gael fod y person cyntaf i fod yn gyfrifol am edrych ar ôl y blog. Dwi mewn ysgol yng Ngogledd Cymru, felly dyda ni ddim wedi gwneud i chi deithio’n rhy bell o’r Alban wythnos yma! Dwi’n ferch naw oed hefyd, felly dyda ni ddim wedi newid gormod yn syth! Mi wnes i ddewis yr enw BLOD gan fy mod yn hoff o flodau, ac mi roeddwn eisiau enw Cymraeg gan ein bod yn siarad Cymraeg yn ein hysgol, Ysgol Kingsland. Dyma fy nghinio ysgol. Heddiw mi ges i spaghetti bolognaise. Roeddwn yn ei hoffi. Cefais bys a salad hefo fo. Hefyd, mi roedd yna fara garlleg ond mi wnes i anghofio cymryd ei lun! Rydym yn cael math gwahanol o fara yn ddyddiol, ac mae’n cael ei bobi yn y gegin bob bore. I bwdin cawsom ddewis rhwng muffin siocled neu ffrwyth. Dewisais y muffin, ond mi roedd o yn dal yn iach oherwydd bod yna gynhwysyn arbennig ynddo. Fedrwch chi ddyfalu beth oedd o? Mi wnâi adael i chi wybod yfory! Hi it’s BLODYN here, but you can call me BLOD. Sorry if I gave you a shock – did you remember that VEG is on holiday? It's a great honour to be the first guest blogger. I’m in a school in North Wales, so we haven’t made you travel too far from Scotland this week! I am also a nine year old girl, so we are not changing too much straight away! BLODYN is Welsh for flower, by the way. I like flowers. I chose a Welsh pen name because we speak Welsh at my school, Ysgol Kingsland. Here is my school dinner. Today I had spaghetti bolognaise. I liked it. I had peas and salad with it. There was also garlic bread but I forgot to take a photo of it! We have different kinds of bread every day and it is always made that morning in the kitchen. For dessert we had a chocolate muffin or fruit. I chose the muffin but it was still healthy because there is a secret ingredient. Can you guess what it is? I’ll tell you the answer tomorrow! There are rules for the school kitchens in our country – the meal must fulfill nutritional standards. It is also important how the meal looks like isn´t it? I am sending you also one lunch picture. There is pulses soup (soup from lentils, peas and beans), cod fillet baked with potatoes and cheese, boiled potatoes. Every day the children have some vegetable – today it is lettuce salad – the whole bowl. The children have dessert only some days. For drink they can choose fruit drink or fruit milk. The meals are not expensive; we pay about 80p for one lunch. BLOD here again. I think Jana’s dessert looks beautiful and it is served nicely in the glass. In our school we don’t have soup, but yours looks nice. In our school the menu is in blocks of three weeks. Ours are also healthy menus but they are delicious too! PS Great news! VEG's Just Giving page for Mary's Meals went through £110,000 today! Thanks to you all. Lovely to see Never Seconds' first guest blogger! Your lunch looks nice today and so does Jana's. Is the secret ingredient in that chocolate muffin courgette, I wonder? Hi Blod, congratulations on a great first world tour post! My children (Oscar age 6 & Eloise age 4) like your lunch as spaghetti bolognese is one of their favourite meals. We are looking forward to hearing the secret ingredient in the cupcake. They think it could be a fruit or a type of vegetable. p.s Well done Veg and everyone who has donated what an amazing amount to have raised! Congrats on your blog post, BLOD! I love that you posted in Welsh and English! Is it carrot, the secret ingredient?? I was curious, would google be able to translate the Welsh? Yes, it did, it even translated your name as flower. The Czech meal look quite appetising. This does not surprise me. I had a Czech friend who was over in England. She was highly critical of the food, except when I took her out, as she said I always found somewhere that served good food. Congratulations on passing seven million hits on the blog. What do the counts means? I think the secret ingredient is beetroot. Hi! How lucky you get to guest blog for NeverSeconds! Looks like a good dinner to me. I'm thinking the secret ingredient might be zucchini? Can't wait to find out. hi BLOD, great post for the first guest blogger, well done! I think there's maybe beetroot in the muffin? Chocolate and beetroot cake is my favourite so I hope it is!! Secret healthy ingredient: it's got to be chocolate, right? It's an antioxidant. 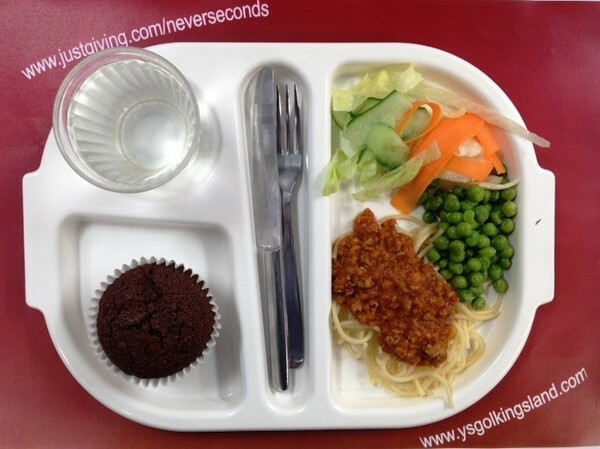 The meals from both schools look absolutely delicious. Thanks to everybody who is sending in, and to VEG and VEG's dad for posting lunches. Great blog! I am guessing beet root as the secret ingredient. It helps keep the sponge cake moist. I started reading the beginning of the post and was shocked to see it in Welsh, I can sort of understand it, my Dad's father's side of the family speack Welsh, By the way I am in the United States. You did a Wonderful job with your first Guest post as a guest blogger! I am looking forward to finding out what makes the muffin healthy. Two fantastic looking lunches. They make me hungry even though I just had a pizza supper. Both terrific blog reports. I say the secret ingredient is good old fashioned bran. Welsh looks like an interesting language! I can't even read it, myself. Thanks for the guest blog, BLOD! So nice to have a guest blogger, and such fun to start with a mystery! There are many good guesses as to the secret ingredient and, aside from the chocolate itself, I will guess bran or wheat germ as the texture of the muffin looks a bit grainy in the picture. I haven't put beets in cake before, though we do like to make pumpkin and zucchini bread here in the US, and I have often added applesauce or other fresh fruit to muffins to lower the fat content and add moisture. I shall have to give beets a try! Hi BLOD! Your meal looks faboulous! And I agree, Jana's desert looks beautiful. I should know better than to read this blog before I eat, now all I want is spaghetti! Also, I wish I spoke Welsh. I look foreward to tomorrow's post! An excellent first post BLOD and very much in the style of VEG. Well done. Your dinner looks quite appetising. I wait to see what the rest of the week brings. Eich blog yn dda iawn, fod yn falch! Great blog post, BLOD. I enjoyed every word - even the Welsh ones I couldn't understand! Lucky you, going to a school that bakes its own bread. I can't wait to find out how they make the choc muffins. Hi from Sweden! I love this blog and Blod, you are a great guest blogger. Swedish school dinners don't have a great reputation sadly. I once heard that the government spends more money on prison dinners then it does on school dinners. Terrible! Nice to read your first entry on the blog. And I am curious to read the next ones. I guess the secret ingredient is Blueberry! Well done, Blod. Veg had better look out. She has stiff competition here! Dw i'n hapus iawn darllen llawer o Gymraeg, felly llongyfarchidau gan Caerdydd! Yr wyf yn edrych ymlaen at weddill yr wythnos. When did all schools get these amazing all-in-one plates?! They are very clever. Today's blog was as good as usual, loving BLOD's writing style. I moved to Wales for university three years ago, but I'm finding Welsh very tricky to learn. Maybe your posts will help! Da iawn ti. Dw i wedi bod yn dilyn dy stori ers tro felly braf iawn i weld cofnod blog yn Gymraeg heddiw. Cyfarchion o Gaerdydd. Blog dda, Blod! Dda i glywed o ogledd Cymru- mae eich fwyd yn edrych llawer gwell nag ein fwyd ni yn y de! Dydyn ni ddim yn gallu aros i wybod beth yw'r gynhwysyn arbennig yma sydd yn y muffin! Yn edrych ymlaen yn fawr iawn am y blog fori, mae`n cwl dy fod yn dod a chymraeg i gymaint o bobl! There are soooo many potatoes on the other plate, wow. I reckon the secret ingredient in that muffin is beetroot; chocolate and beetroot is quite a popular combination. Looks good!! Great guest post! I'm going to guess the secret ingredient is avocado, although I think all the other guesses are good, too! Those both look like great lunches. I notice the open cups. Do you have many drinks spilled? At my daughter's school, they get milk, juice or water in a plastic jug or bottle. I guess you could still spill, but with the narrow neck it wouldn't go everywhere. When I was in school we had drinks in boxes (or pyramid-shaped containers) with straws. Spillage on a daily basis at the start of the year! But the children have to go and find a cloth to sort it out themselves so they quickly learn!